Photo by Rise Media courtesy of Corcoran. 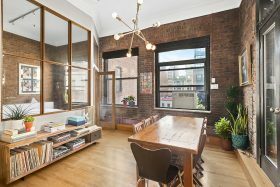 This one-bedroom top-floor loft at 12 East 14th Street at Fifth Avenue in Greenwich Village near Union Square has plenty merits for loft lovers. But the best bonus might be the co-op’s private 1,000-square-foot landing strip-sized roof terrace. 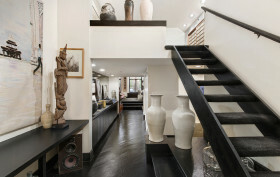 In the world of New York real estate, there’s generally a rule: wood floors are good, and carpeting… not so much. It gets dirty, doesn’t look as authentic, and there are usually gorgeous wood floors hiding underneath. This is especially true for loft apartments, which are typically dominated by wood flooring throughout. But not this one, at 12 East 14th Street in Greenwich Village. And you know what? We don’t hate it. Maybe it’s the handsome blue color and the way it blends into the furniture. Or the idea of having a nice cushion underneath our feet. (Plus, this loft hasn’t totally abandoned its wood floor roots… you’ll find some in the kitchen and the hallways.) The co-op apartment is now on the rental market for $7,250 a month. It comes fully furnished, so the renter is going to have to embrace that carpet living.